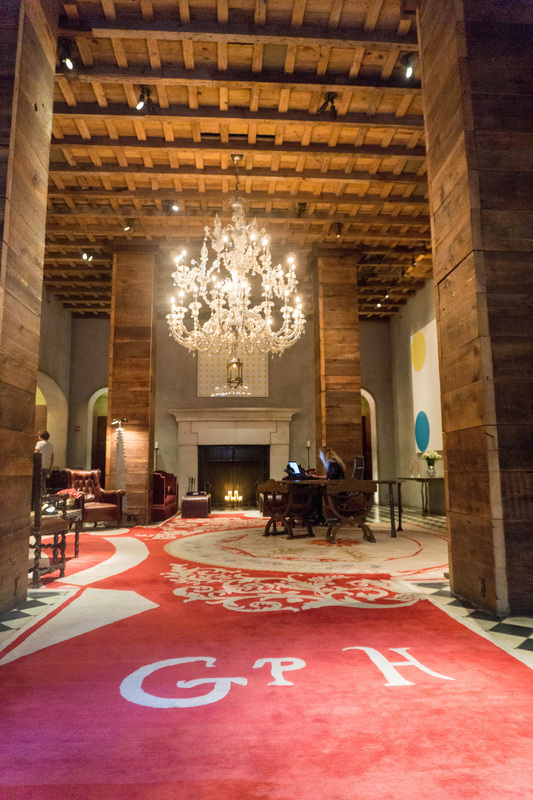 The Gramercy Park Hotel is a luxury boutique hotel in the heart of Manhattan. We stayed there for a night during our recent visit as a birthday treat for myself. Of course, it being New York City, I was spoiled for choice of luxury hotels. 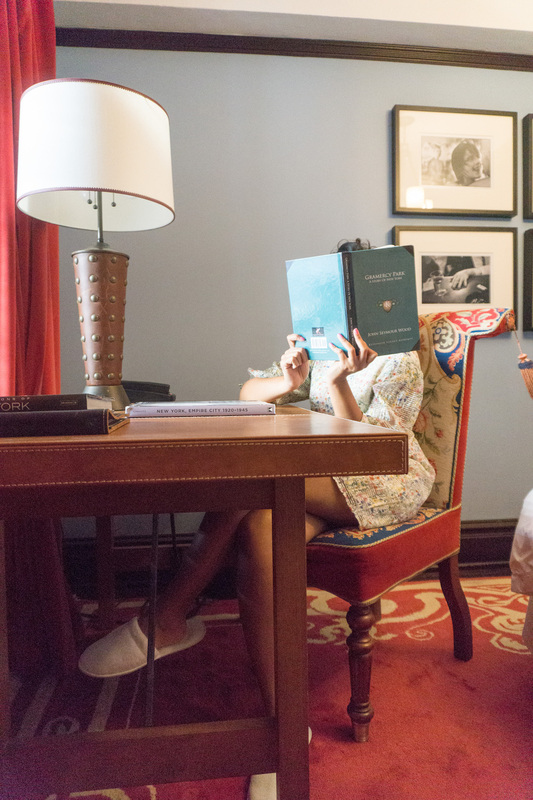 There are literally hundreds in Manhattan, so why did I choose the Gramercy Park Hotel? The key to my choice was an actual key to the last private park in Manhattan, Gramercy Park. 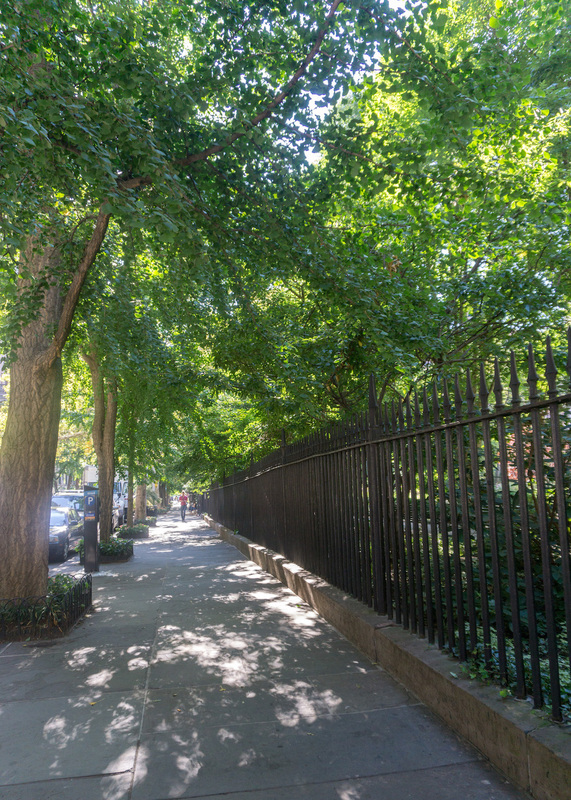 The Gramercy Park was opened in 1831 for the residents of the Gramercy neighborhood. The first keys to the park were actually made of solid gold! Times have changed, and the keys are now made of nickel, but the park itself is still as precious, an oasis of peace within the crowded city. The Park is open from dawn till dusk when it’s not raining. It is locked from the outside and from the inside, so you can only get in with a key. And those keys, only available to residents, are so hard to come by! 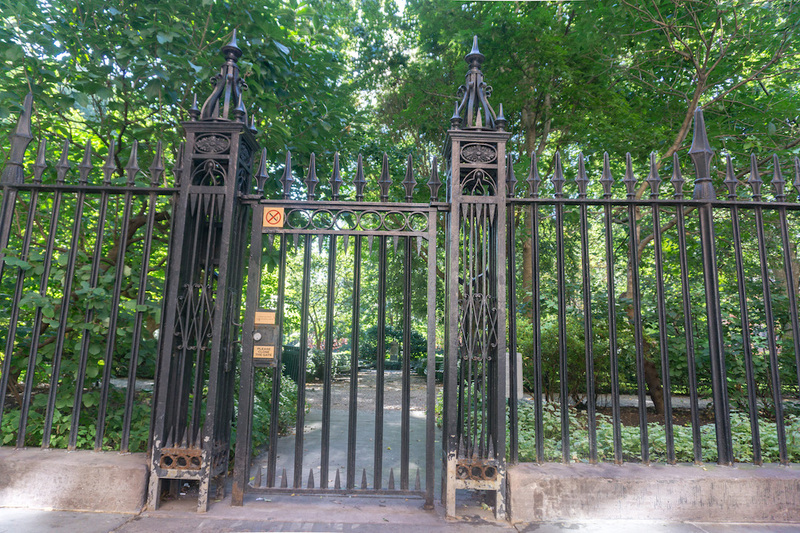 I don’t remember when I first read about Gramercy Park, but the name was always imprinted in my mind as one synonymous with a more graceful and luxurious time. And then, a few years ago, this New York Times article caught my eye, because it specifically talked about how to get into this exclusive park! I am obsessed with urban gardens so when it came to planning for our New York City trip, the park was at the top of my list. Luckily the reality stood up well to my high expectations. Entering the gates of the parks brings you into a different world. Gone is the hustle and bustle of the street outside, the cars, the taxis and the honking feels far away. Instead, you are welcomed into a pretty, green space by a team of squirrels scurrying around. They still look busy, I assume since they are New York City squirrels. Any shuffles you might hear probably belong to them, because you will meet very few people here. 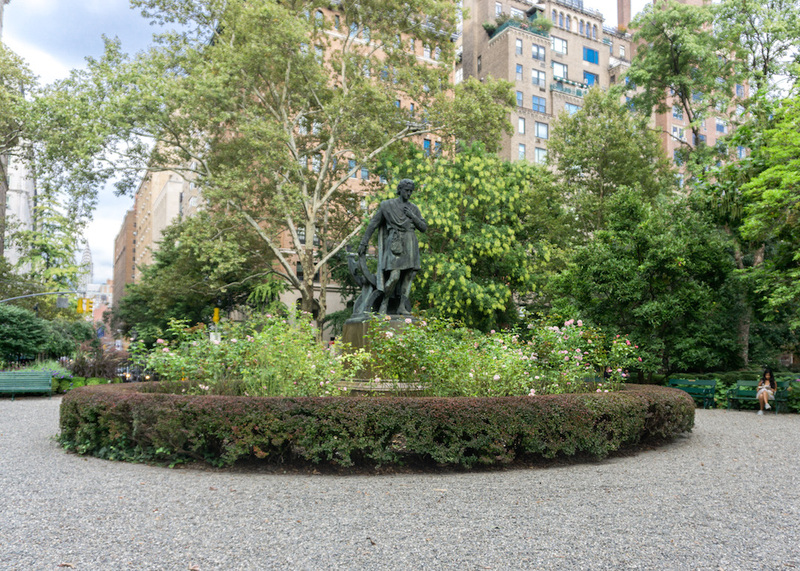 The park offers tree lined paths with plenty of benches on the side, fresh green grass (that you are not allowed to tread on), a fountain dedicated to the founder Samuel B. Ruggles, a statue of Edwin Booth and Calder’s Janey Waney sculpture. The list above is accurate, but it doesn’t mention what the park truly offers – a sense of solitude in a city teeming with millions, a breath of tranquility in a city that never sleeps, and a moment of safety and clarity in a fast-paced, sometimes unforgiving world. This little squirrel drinking from the fountain just melted my heart! We spent enough time at the Park to satiate my long time desire to visit and get a feel of the park. It was so worth it, a bucket list item completed, and the perfect birthday treat! 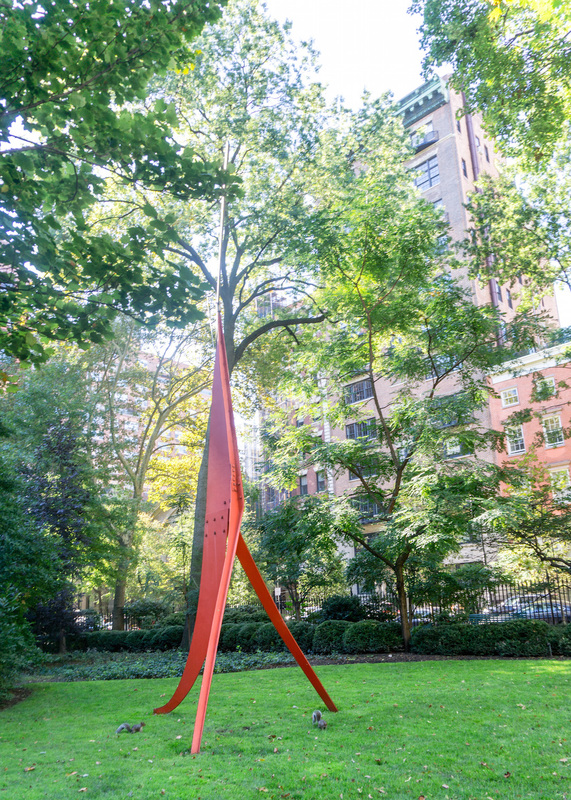 Note : Gramercy Park is open to the public on Christmas Eve (December 24th). However, most of the amazing experience of the park comes from it’s exclusivity – being quiet and serene, and during lovely weather – to enjoy a book or a good conversation – so this day may not be the perfect representation of it. Keep reading for more information on how you can get to visit the park and experience it for yourself! 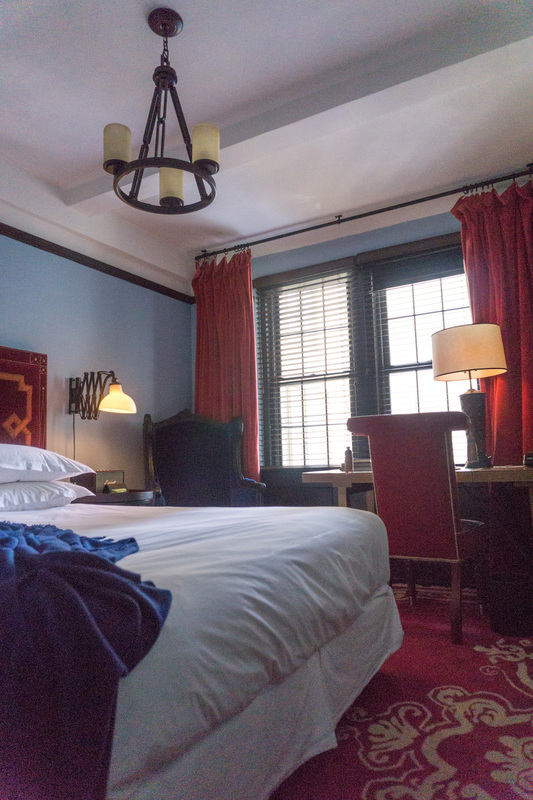 This hotel is located in the Gramercy Park neighborhood in Manhattan, walking distance to the Flatiron Building, East Village, Lower East Side, Soho, Chelsea, Nolita etc. The location and neighborhood is excellent in my opinion. Key Offerings : A Key to Gramercy Park (the doorman escorts you to and from), amazing location and neighborhood, cool design. 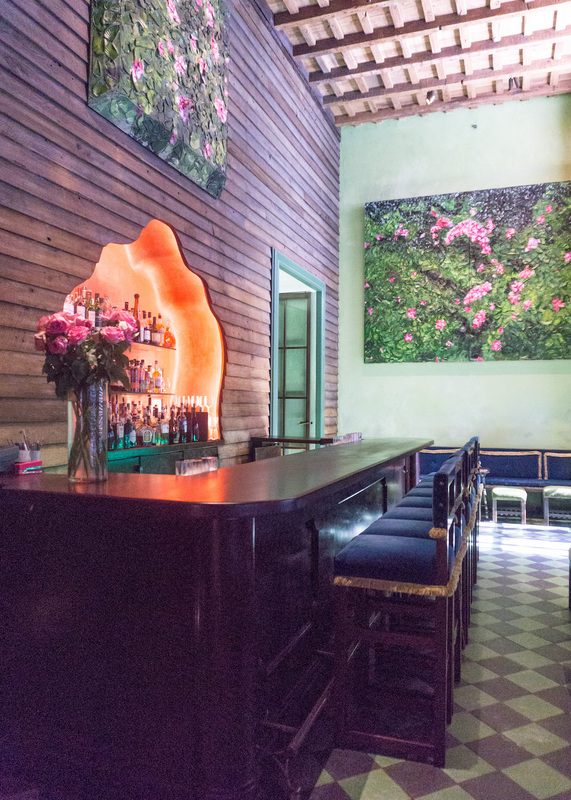 Price : The Gramercy Queen starts at around $450, and room rates go up from there. Check current prices on their website. Price Hacks : You could book through points earned with SPG (Starwood Preferred) or Credit Cards (I used Chase Sapphire Reserved points to book). Sometimes (although rarely these days) travel sites such as Expedia offer cheaper rates. 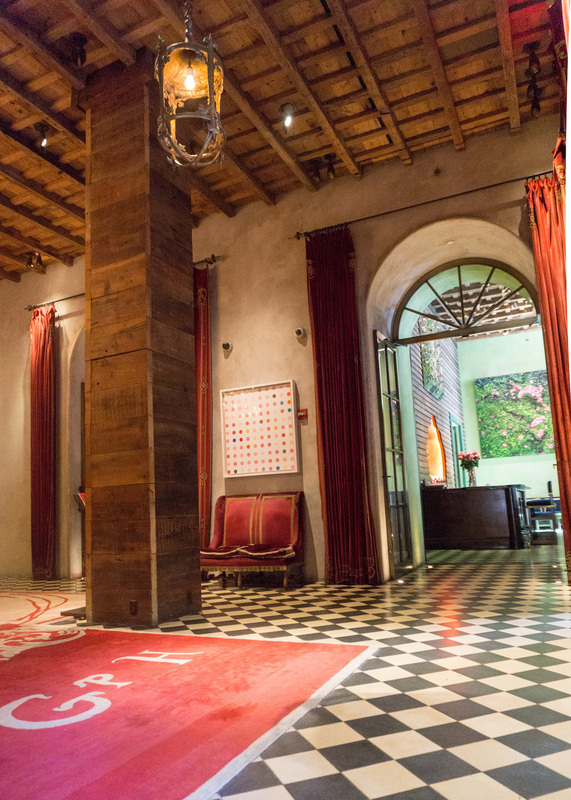 The moment you enter the Gramercy Park Hotel, you feel transported into a world of dark luxury. Deep reds, greens and velvet blue accents dominate, and you leave the daylight far behind. 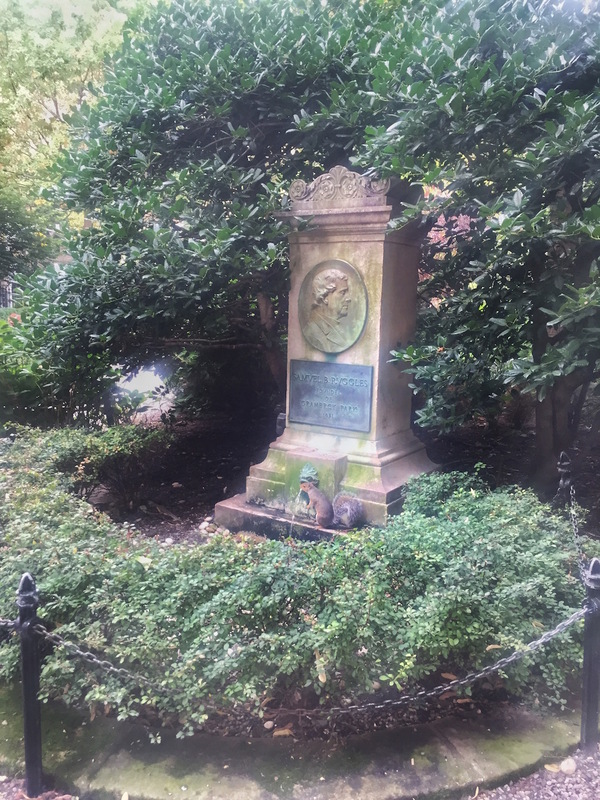 The decor is a strange juxtaposition to the light, lovely, tranquil Gramercy Park, and I wondered if the irony was purposeful. 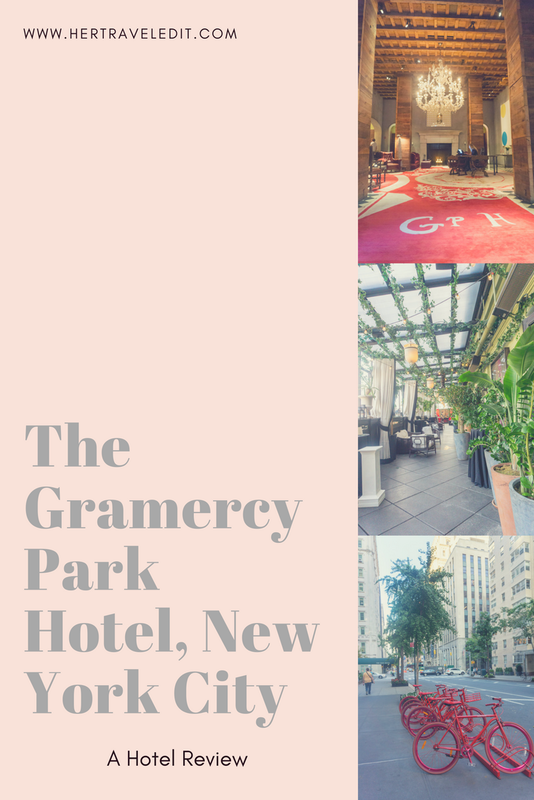 We stayed in a Gramercy Queen, and were shocked to see how small it was. The design was a little strange because there was a walk in closet (luxury! ), but an extremely small bathroom (stress!). The room was of course, dark and moody, somewhat like a spoiled teenager. We didn’t plan to spend much time in the room anyway, so this did not bother us a lot, but my personal preference is always for something light and airy. However, the art all over the hotel was very interesting, and it did go very well with the overall theme. 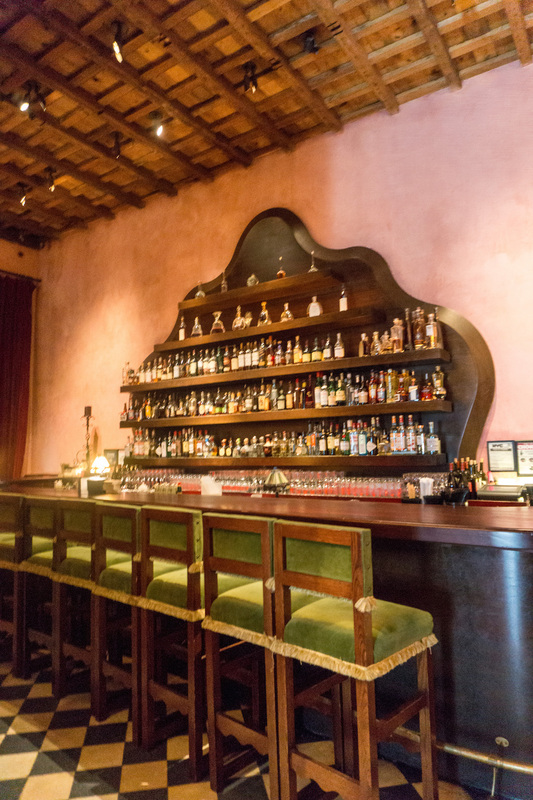 The Gramercy Park hotel offers two moody bars for exotic cocktails and hobnobbing with celebs. I like my rooms light and airy, but I do have a thing for moody bars, so I loved walking through them in the daytime when absolutely no one else was around. Unfortunately, we did not get a chance to visit in the evening, so I cannot comment on the exoticness of the cocktails or the celebs. My favorite part about the inside of the Gramercy Park Hotel was the Rooftop Terrace. 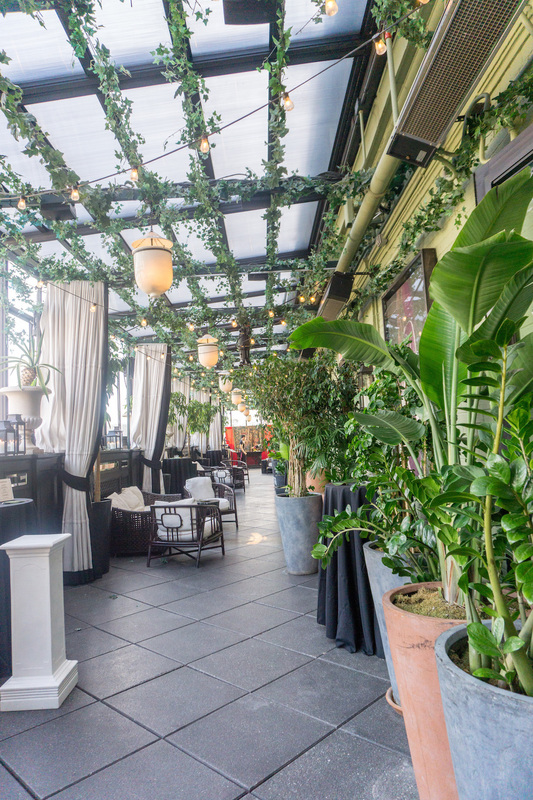 They have a lovely rooftop garden, and the lounge area inside has a gorgeous chandelier. I couldn’t take too many pictures because they were setting up for an event and quickly hustled me out, but I liked what I saw! The Gramercy Park hotel service was decent, the front desk staff were very polite and helpful, and so was the room service. I say decent, and not excellent, because I was a bit miffed at the end, when they took over half an hour to hand us back our stored luggage before we left the hotel. It’s funny how a tedious half hour can totally change your outlook and maybe even your review on a hotel, isn’t it? 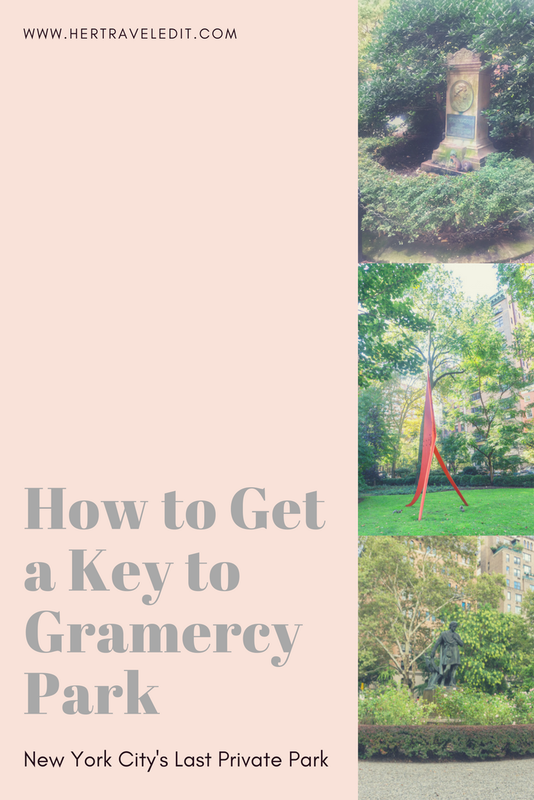 I loved my one night stay at the Gramercy Park Hotel because it gave me access to the park, and because I loved the neighborhood. The area is calmer than most, tree-lined and lovely. It’s still very convenient however, and we could walk to a lot of places on our list, or to a convenient subway station. If you are as enamored by Gramercy Park as I am, then either befriend a resident, or stay at the Gramercy Park Hotel. If you don’t care too much about escaping to the oasis that is the last private park in Manhattan, then pick another luxury boutique hotel. The city is crawling with them. Since there are so many to choose from, I suggest narrowing down to an area first (Manhattan is bigger than you think), and then picking one out. 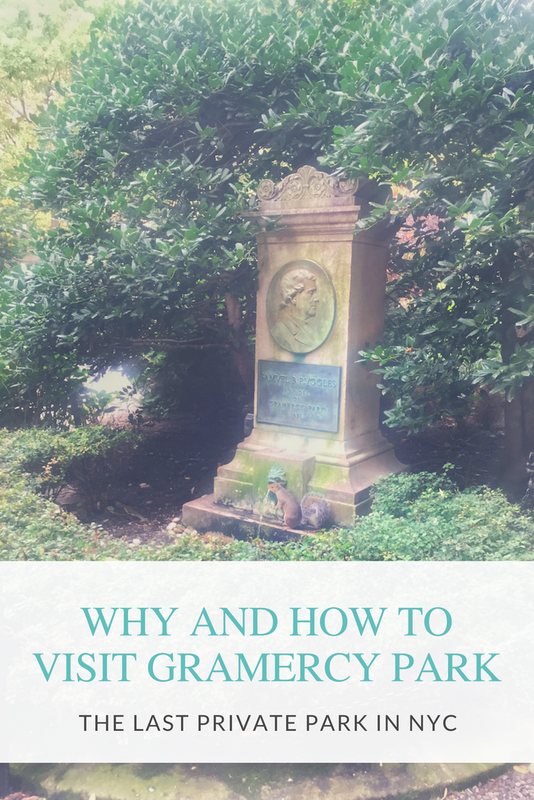 Hope you enjoyed this review and learned a bit about Gramercy Park! Here’s a pin to store it for future reference! Come back to the blog for more New York City travel guides and tips, or sign up for my newsletter to receive them in your inbox! wow! looks so so beautiful! Yes, it was just gorgeous and so peaceful! What a lovely place to stay – looks relaxing and tranquil! I, too, love this part of NYC because of the calm atmosphere. I must keep this place in mind when I go back to NYC! Wow, the architecture and design of this place is unreal. We agree, that terrace looks like it would be our favorite spot too! Wow, this hotel looks pretty fabulous. And a key to the local park is so charming! It reminds me of the film Notting Hill (though that is in London, I know.) And complimentary bikes are such a great idea! I have never thought about biking through NYC. Might wanna try it the next time. omg I loved Notting Hill!! 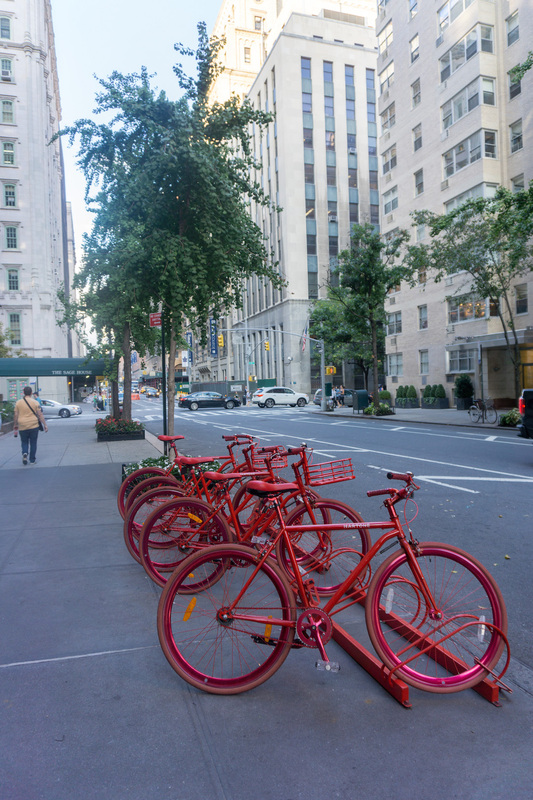 About the bikes – I was too scared to ride in the NYC traffic heheh. You seem braver than me! Wow it looks wonderful there – I would love to stay in a luxury hotel like that! Also the terrace is so pretty – perfect for instagram haha! Yes, the private park was my favorite part! !